[Update] On the other hand, it seems hard to believe that you could expect someone to just walk up to a machine and put a needle in your arm. Then again, it is also hard to believe that anyone would want a washing machine for people, but they really do exist. [Update 2] Someone commented that this item looks like a standard photo booth that had been Photoshopped with a different name and information. Looks like this one's a fake. That's a first for this site! I'll have to work harder at checking. 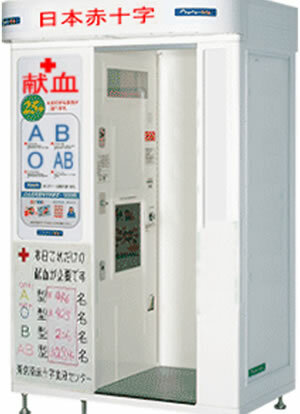 According to my brother-in-law, who translates Japanese documents for businesses and has lived in Japan for years, the picture of the booth says "Japan Red Cross" and "Blood Donation" (the red characters at the top). So, if it's a fake, it's a good one! The manufacturer's name is not quite legible. Here in the U.S., of course, we donate blood the old-fashioned way. Many areas of the country are suffering shortages of blood for emergent and elective surgeries. To help, see givelife.org or call 1-800-GIVE-LIFE to make an appointment (with a person!). SF offers many possibilites for do-it-yourself or automated medicine; see the revitalizer console from John Varley's 1983 novel Millenium for an example. Story from Japan guide of Gami via Futurenews.at.